The Rochester Quadrajet was a standard production four-barrel carburetor used by every General Motors division for nearly 20 years. Although it never deviated far from its original basic design, the Quadrajet underwent several modifications over the years, proving its versatility over a wide variety of applications. From a practical standpoint, most Quadrajets were never intended to be “high-performance” carburetors. General Motors produced vehicles for a very broad customer base, and each division developed its own engines. Since many different engines were offered in a wide variety of vehicles, nearly every carburetor was calibrated for the specific application. With ever-increasing federal emission standards, manufacturers were forced into making their engines as efficient as possible, which led to future changes.To better understand the Quadrajet, we must start right from the beginning. The Rochester Products division of General Motors was located in Rochester, New York, and had built single and multiple-bore carburetors for GM vehicles since 1949. Rochester’s 4-barrel casting known as the 4G had been one of GM’s standard production carburetors, but as economy and emissions concerns grew, Rochester responded with an entirely new 4-barrel carburetor, the Quadrajet. It boasted small primary bores for maximum throttle response and fuel efficiency, and larger secondary bores to meet the overall flow demands under full-throttle conditions. The Quadrajet was designated the 4M series. This would be the basic casting from which all future variations evolved. Chevrolet was the first and only GM manufacturer to use the 4M Quadrajet in 1965. The 4G 4-barrel, however, was used on other Chevrolet V-8 applications, while radical, high-performance applications retained the Holley 4-barrel. Shown here is a 1966 Quadrajet, carburetor number 7026260. 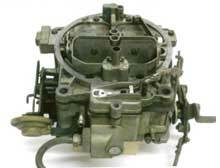 This basic design was typical of very early production carburetors. Carburetors produced in later years would appear similar externally, but many internal changes were made to make them more reliable. The Quadrajet saw expanded use onto a wide variety of 1966 Chevrolet V-8 and Buick 400 and 425 V-8 cubic-inch engines in 1966. Oldsmobile followed suit. By 1967 Cadillac and Pontiac too had begun installing the Quadrajet on most of their 4-barrel applications. With its growing popularity and efficient design, the Quadrajet was the most widely used production 4-barrel carburetor on GM-produced engines during that time. And though other carburetors such as the Rochester 4G, the Carter AFB, and the Holley 4-barrel were used on certain engines, the Quadrajet quickly became a benchmark for other 4-barrel carburetor manufacturers. The 1968 model year marked the first nationwide federal standards for specific pollutants. And because of its efficiency and excellent balance of economy and performance, the 4M Quadrajet became the standard production 4-barrel carburetor for all GM manufacturers. The Rochester 4Gwas phased out as the Quadrajet replaced everything except the Holley 4-barrel, which continued on certain Chevrolet applications through 1972. The carburetor on the left is a Rochester 4GC, used widely by General Motors until the Quadrajet (shown on the right) was introduced. With the Quadrajet used by all GM divisions, each manufacturer required certain characteristics that matched its under-hood routings. The most common difference is the forward-facing fuel inlet as opposed to those that are side facing. One of the first major changes to the Quadrajet design was making it available in both front- and side-inlet models, shown here. The front inlet is shown on the right; side inlet is on the left. The Quadrajet was used on such a wide variety of engine sizes from each respective automobile manufacturer, that separate fuel-metering circuits and a variety of vacuum sources were also required and each carburetor was given a specific casting number. The product identification numbers were stamped into a circular disc located on the driver’s side of the main body up to the 1968 model year. Demand from the divisions had increased to the point that Rochester could not meet the volume requirements.